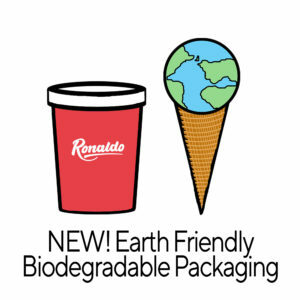 Being as eco-friendly as possible is important to us at Ronaldo Ices, and in 2019 we launched our very first range of biodegradable retail tubs. They are bright, bold, and filled with our trademark delicious ice cream. Traders can request a sample here. By sourcing many of our ingredients locally instead of importing we are able to keep our carbon footprint low. Much of our local fruit is sourced from as little as 10 miles down the road. Not only is this kinder to the environment, it also means we can showcase an authentic taste of Norfolk in our ice cream and sorbets. Old machinery can be slow, glitchy and horribly inefficient when it comes to burning energy. At Ronaldo Ices we are committed to running our factory as efficiently as possible. By investing in new, machinery we are able to produce more ice cream for less energy. Better for the environment, and more ice cream for our lovely customers. A win-win! Keep all our existing and new customers and suppliers informed about our environmental policy. Maintain good housekeeping for the use of machinery, cold stores and electrical equipment. training into the induction programme for new starters. Introduce a new supplier evaluation system to favour businesses with shorter supply lines. Continue to evaluate the costs and benefits of updating plant and machinery.